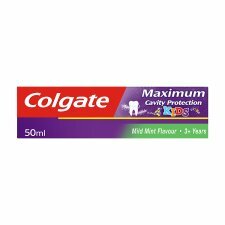 Give your child the chance to be cavity free with Colgate® Maximum Cavity Protection Mild Mint Kids 3+ Years Toothpaste. Colgate® Maximum Cavity Protection Toothpaste is clinically proven to fight tooth decay in two ways. First, its patented Sugar Acid Neutraliser™ helps to deactivate sugar acids before they can harm teeth. Second, it contains fluoride and calcium to strengthen and remineralise enamel to help prevent cavity formation. Directions: Parents supervise brushing twice a day. Ensure children spit out after brushing to minimise swallowing and avoid rinsing with water. 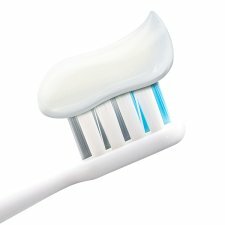 Children of 6 years and younger - use a pea-sized amount for supervised brushing to minimise swallowing. In case of intake of fluoride from other sources consult a dentist or doctor. For best performance, keep cap closed when not in use.